Schematic of a trigger point complex of a muscle in longitudinal section. A: The central trigger point (CTrP) in the endplate zone contains numerous electrically active loci and numerous contraction knots. 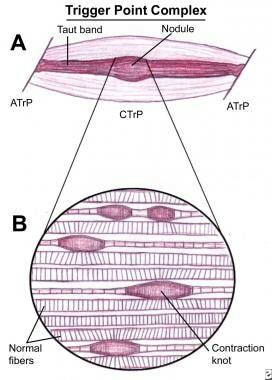 A taut band of muscle fibers extends from the trigger point to the attachment at each end of the involved fibers. The sustained tension that the taut band exerts on the attachment tissues can induce a localized enthesopathy that is identified as an attachment trigger point (ATrP). B: Enlarged view of part of the CTrP shows the distribution of 5 contraction knots. The vertical lines in each muscle fiber identify the relative spacing of its striations. The space between 2 striations corresponds to the length of 1 sarcomere. The sarcomeres within one of these enlarged segments (ie, contraction knot) of a muscle fiber are markedly shorter and wider than the sarcomeres in the neighboring normal muscle fibers, which are free of contraction knots. Descriptions of myofascial pain date back to the mid-19th century, when Froriep described muskelschwiele, or muscle calluses. He characterized these calluses as tender areas in muscle that felt like a cord or band associated with rheumatic complaints. In the early 1900s, Gowers first used the term fibrositis to describe muscular rheumatism associated with local tenderness and regions of palpable hardness. Cervical myofascial pain is thought to occur following either overuse of or trauma to the muscles that support the shoulders and neck. It can also occur as a reaction to an underlying spinal pathology such as facet joint arthropathy or an annular tear in one of the cervical discs. Common scenarios among patients are recent involvement in a motor vehicle accident or performance of repetitive upper extremity activities. In the cervical spine, the muscles most often implicated in myofascial pain are the trapezius, levator scapulae, rhomboids, supraspinatus, and infraspinatus. Trapezial myofascial pain commonly occurs when a person with a desk job does not have appropriate armrests or must type on a keyboard that is too high. Other issues that may play a role in the clinical picture of cervical myofascial pain include endocrine dysfunction, chronic infections, nutritional deficiencies, poor posture, and psychological stress. Myofascial pain is thought to occur commonly in the general population. As many as 21% of patients seen in general orthopedic clinics have myofascial pain. Of patients seen at specialty pain management centers, 85-93% have a myofascial pain component to their condition. Cervical myofascial pain occurs in both sexes, but with a predominance among women. Myofascial pain seems to occur more frequently with increasing age until midlife. The incidence declines gradually after middle age. When the patient with cervical myofascial pain undergoes appropriate treatment (eg, physical therapy, massage therapy, stretch and spray, trigger point injections, identification and elimination of an underlying, triggering pathology), the prognosis is generally good. However, recurrence can be a common scenario. Outcomes seem to be better when treatment is initiated early in order to prevent compensation patterns that exacerbate pain. Increased mortality is not associated with cervical myofascial pain. Patients with cervical myofascial pain need to be educated regarding the factors or underlying problems that may contribute to their pain and loss of mobility. The physical therapist can educate the patient on proper exercise habits and instruct them in a home exercise program for stretching and reconditioning. The patient also may benefit from specific exercises and strategies to improve posture awareness and body mechanics with activities of daily living. If poor workplace ergonomics contribute to the patient's condition, offer instruction in proper ways to modify and revamp the workstation. Cervical myofascial pain is a treatable condition if the patient is educated on the condition and takes an active role in the recovery process. For patient education information, see Temporomandibular Joint (TMJ) Syndrome, Fibromyalgia, and Chronic Pain. Duyur Cakit B, Genc H, Altuntas V, et al. Disability and related factors in patients with chronic cervical myofascial pain. Clin Rheumatol. 2009 Feb 18. [Medline]. Touma J, Isaacson AC. Pain, Cervical Myofascial. 2018 Jan. [Medline]. [Full Text]. Harden RN, Cottrill J, Gagnon CM, et al. Botulinum toxin A in the treatment of chronic tension-type headache With cervical myofascial trigger points: a randomized, double-blind, placebo-controlled pilot study. Headache. 2008 Oct 10. [Medline]. Hong CZ, Simons DG. Pathophysiologic and electrophysiologic mechanisms of myofascial trigger points. Arch Phys Med Rehabil. 1998 Jul. 79(7):863-72. [Medline]. Ballyns JJ, Shah JP, Hammond J, Gebreab T, Gerber LH, Sikdar S. Objective sonographic measures for characterizing myofascial trigger points associated with cervical pain. J Ultrasound Med. 2011 Oct. 30(10):1331-40. [Medline]. Ghanavatian S, Derian A. Tizanidine. 2018 Jan. [Medline]. [Full Text]. Park KD, Lee WY, Park MH, Ahn JK, Park Y. High- versus low-energy extracorporeal shock-wave therapy for myofascial pain syndrome of upper trapezius: a prospective randomized single blinded pilot study. Medicine (Baltimore). 2018 Jul. 97 (28):e11432. [Medline]. [Full Text]. Ma C, Szeto GP, Yan T, Wu S, Lin C, Li L. Comparing biofeedback with active exercise and passive treatment for the management of work-related neck and shoulder pain: a randomized controlled trial. Arch Phys Med Rehabil. 2011 Jun. 92(6):849-58. [Medline]. Ay S, Konak HE, Evcik D, Kibar S. The effectiveness of kinesio taping on pain and disability in cervical myofascial pain syndrome. Rev Bras Reumatol. 2016 Mar 9. [Medline]. Moustafa IM, Diab AA, Hegazy F, Harrison DE. Does improvement towards a normal cervical sagittal configuration aid in the management of cervical myofascial pain syndrome: a 1- year randomized controlled trial. BMC Musculoskelet Disord. 2018 Nov 12. 19 (1):396. [Medline]. [Full Text]. Lee SH, Chen CC, Lee CS, et al. Effects of needle electrical intramuscular stimulation on shoulder and cervical myofascial pain syndrome and microcirculation. J Chin Med Assoc. 2008 Apr. 71(4):200-6. [Medline]. Affaitati G, Costantini R, Tana C,et al. Effects of topical vs injection treatment of cervical myofascial trigger points on headache symptoms in migraine patients: a retrospective analysis. J Headache Pain. 2018 Nov 8. 19 (1):104. [Medline]. [Full Text]. Jabbari B. Botulinum neurotoxins in the treatment of refractory pain. Nat Clin Pract Neurol. 2008 Dec. 4(12):676-85. [Medline]. Nicol AL, Wu II, Ferrante FM. Botulinum toxin type a injections for cervical and shoulder girdle myofascial pain using an enriched protocol design. Anesth Analg. 2014 Jun. 118(6):1326-35. [Medline]. [Full Text]. Cross-sectional drawing shows flat palpation of a taut band and its trigger point. Left: A. The skin is pushed to one side to begin palpation. B. The fingertip slides across muscle fibers to feel the cord-line texture of the taut band rolling beneath it. C. The skin is pushed to the other side at completion of the movement. This same movement performed vigorously is called snapping palpation. Right: A. Muscle fibers are surrounded by the thumb and fingers in a pincer grip. B. The hardness of the taut band is felt clearly as it is rolled between the digits. C. The palpable edge of the taut band is sharply defined as it escapes from between the fingertips, often with a local twitch response. Longitudinal schematic drawing of taut bands, myofascial trigger points, and a local twitch response. A: Palpation of a taut band (straight lines) among normally slack, relaxed muscle fibers (wavy lines). B: Rolling the band quickly under the fingertip (snapping palpation) at the trigger point often produces a local twitch response, which usually is seen most clearly as skin movement between the trigger point and the attachment of the muscle fibers. Cross-sectional schematic drawing shows flat palpation to localize and hold the trigger point for injection. A and B show the use of alternate pressure between 2 fingers to confirm the location of the palpable module of the trigger point. C shows the trigger point being positioned halfway between the fingertips to keep it from sliding to one side during the injection. Sequence of steps to use when stretching and spraying any muscle for myofascial trigger points. Schematic drawing showing how the jet stream of vapocoolant is applied.